In the months before she died, my mother obsessed over a single event from her early life—a time when she scrawled an image on the kitchen wall, displaying her skill and testing the bounds of parental authority. Why she returned to that event, telling the story over and over despite the fog of dementia, no one can ever say. But I speculate her passion for creative expression had a lot to do with how she lived her life, what she chose to remember about it, and what she was proud to pass on. Not the word my older sister would likely use to describe herself, and yet, she too has a good dollop of my mother’s legacy. In her case, the inheritance is more a liberal sprinkling of creative dust, like a first winter snow across the landscape. Recently, she took up the almost forgotten art of quilting. While our grandmother taught us to knit and crochet so many years ago now, my sister’s quilting is self-taught. Quilting is a process she describes as creating pattern out of chaos. Though influenced by available colors and patterns, she says the quilt comes together only after experimenting with myriad arrangements of pieces of fabric. Her “quilt in progress” is a compilation of hexagons in a dozen ice cream colors, sure to delight a three-year-old granddaughter in her pink phase. Assembled on a spare wall where she can arrange and rearrange the pieces, the effect is more free-flowing than a series of straight-edged hexagons might suggest. Still as she contemplates the design, my sister wonders if she’s made chaos out of pattern rather than the other way around. My mother’s batting three for three, so to speak. As I consider her endowment, however, I realize how much or little I know about my siblings. I know, of course, they are wives and mothers and grandmothers and aunts (or in my brother’s case a husband and father and uncle). But, if asked, I couldn’t say how each would describe their life’s work and their legacy. From the perspective of a writer (the creativity manifestation I’ll claim), I challenged myself. I’d explore my sister’s psyche from a distance. The effort, familiar, like breathing life into a fictional character. Let’s call her “Liz” and say she is five feet three inches tall with blond hair and blue eyes, though the sterile description offers little insight. Instead, I could say, she has my mother’s hands, slender fingers with nails in perfect ovals compared with my flat and stunted ones, or she wears her hair in close-cropped curls that conceal gray more effectively than any salon’s dye. Still, these are barely more than physical attributes. And I want to give my character more flesh, more color, more life. As we’re separated by considerable distance, we see each other only once or twice a year. So what I have to complete the exercise are bits and pieces of a life, images and memories of her logged away in my head. They’re like little hexagons and squares and rectangles I have to arrange to reveal the woman, or, in quilting terms, make pattern out of chaos. In her role as mother, and endowed with another family trait, a love of food, my sister cooked countless family dinners. Occasionally, she shared recipes she’d borrowed, tweaked, worked and reworked, and perfected. While I experiment in the kitchen, and sometimes relegate an entire meal to the garbage disposal, a few of Liz’s recipes are family lore. If her thanksgiving specialty, caramelized pecans and sweet potatoes, is absent from the table, everyone is disappointed. And, while I am on the subject of mothers, let me not overlook the art of motherhood. Liz is mother to three—all adults, all gainfully employed and all with families of their own. Not one has robbed a bank, dealt in drugs, or run off to join Ringling Brothers, at least, not that I know. It’s an achievement deserving of the word “art” in capital letters. Liz also has a facility with words, this perhaps inherited from my father’s side. She’s a wordsmith, someone I would not want to tangle with in a game of Scrabble, or “Words with Friends”. She’s fluent in French, a language we both learned as children. I long ago forgot all but a token tourist phrase or two, but somehow the language stayed lodged in her brain and on the tip of her tongue. She’s worked as an editor and copy writer and authored a children’s book. She’s a voracious reader and devours two or three books a week. And, as far as the more traditional visual arts go, she’s painted landscapes and still lifes, even sold a few. As I reflect, I realize how many pieces and shapes I’ve unearthed from memory. Perhaps, if I tack them to the wall, step back, and squint my eyes, I’ll see my sister as a whole woman. Sister, daughter, wife, mother, aunt, grandmother, and artist. One you can expect to see in disguise in a future novel. Postcards from Wonderland. The title of a blog, and a website, and a Pinterest board and Instagram site and Facebook page and email address. Three words to inform about wondrous things. Or as Marta Mela and Angie Grau, owners of the various postcards-from-wonderland sites, put it “las maravillas particular”, literally special wonders. Special wonders indeed. The two young women live in Barcelona and are coworkers as well as lifelong friends. On their sites, as I suspect they do in real life, they share the many things that fascinate them all artfully photographed and described. It’s not hard to find something that appeals. The sites run the gamut from decor to dress, from travel captured in the bold sea-washed colors of the Mediterranean, lavender fields, warm hues of sunset, and lush greens of rain forests to cuisine. Numerous shots of inviting place settings, bowls of steaming mussels or golden sweet potato soups discovered and indulged in favorite corners of their city. Besides blogging, both women are writers as well. Angie keeps a log of the things she wants to do in life, marking them off as she meets her goals. Marta’s the photographer and journalist. She claims her journal is where she stores thoughts that pop into her head so she won’t forget them–as if there’s any danger in that as she’s rarely shown without her camera. Like Marta, I have a passion for photography. The scenes from four vintage postcards of the actual Wonderland Park are included on the pages of my novel. I had to scour the internet for them, but collected a few and persuaded my publisher to include the four as introductions to parts of the book. And, I maintain a second blog and second website that focus on photography, marrying my passions for writing, travel, and photography. Mostly these sites are for my reflection whereas Marta and Angie share their lives with each other and the world. In a recent post I found hints of an addition to their world. Angie’s new baby. As you might expect from these prolific bloggers, the event has spawned posts and photos and thoughts about a new life and the promise that brings. Here’s hoping the newest member of the Postcards from Wonderland family will find many special wonders ahead. I visit gardens when I travel, whether they are public gardens, private gardens, arboretums, nurseries (not the box stores but the old-fashioned kind, the ones owned by people with rough hands and dirt under their nails), garden exhibitions, or even local enthusiasts’ plant sales. These venues are marvelous places, full of beauty and inspiration and often a kindred, sometimes eccentric, spirit, or two, meandering about. Rarely do I leave without an idea to implement in my own garden. As you might expect, I’m smarter now than when I first began my garden journeys. At the outset, like other novices, I’d return from a foray with a new plant in hand and sink it into what I deemed to be its rightful place in the garden. With a minimum of effort (including those tiresome but no less important things like weeding, watering, pruning and fertilizing), a modicum of time, and a large dollop of good fortune, nature rewarded me when she chose with wondrous blooms. My garden awakening came with the purchase of my third or fourth treasure. Suddenly I realized I had to take a step back and consider the larger picture—the canvas, you might say. Did the color of the new rose, or camellia, or azalea compliment the established ones? Would they bloom at the same time, exploding in one single burst of riotous color but leaving me with nothing but dried leaves and bare boughs in the long winter months ahead? Would they surprise me with something new each time I ventured into the garden, heralding the circle of seasons? Was the arrangement defying the principles of design or did it adhere to the tyranny of triangles? Sinking further into my self-imposed form of madness, I began to obsess over textures, scents, and associations. Was there variety in my garden—magnolias with their wide, glossy leaves and boughs studded with lemon-scented summer flowers that spoke of the old south as well as pines, three and five-needled cultivars with cones to collect and toss on a winter night’s fire? Were there pathways through my garden that drew the visitor’s eye, teasing them to take a first step then another, tantalizing and engaging them? I came to realize that I wasn’t merely gardening. I was creating a work of art–a painting on a canvas of earth, a short story in colors and textures and living things. For inspiration, I sought role models from a different sort of gardener, those with a discriminating eye and experience with a trowel. Artists who garden. Fortunately, I have had the privilege to come to know one particularly artful gardener, Brenda Addington. Brenda approaches her garden as an artist first. She brings to it both an inherited sense of grace and craft from her father, a highly skilled artisan in another media, and her own eye for color and line. She is not one to sit inside and admire her garden through the window. I know. On one of the coldest days of the year, I found her planting a few of the thousands of bulbs she had special ordered, just the right colors for just the right spaces. In the spring, if she’s not tending to the dozens of containers that accent her garden, she’s photographing them for her website or blog. 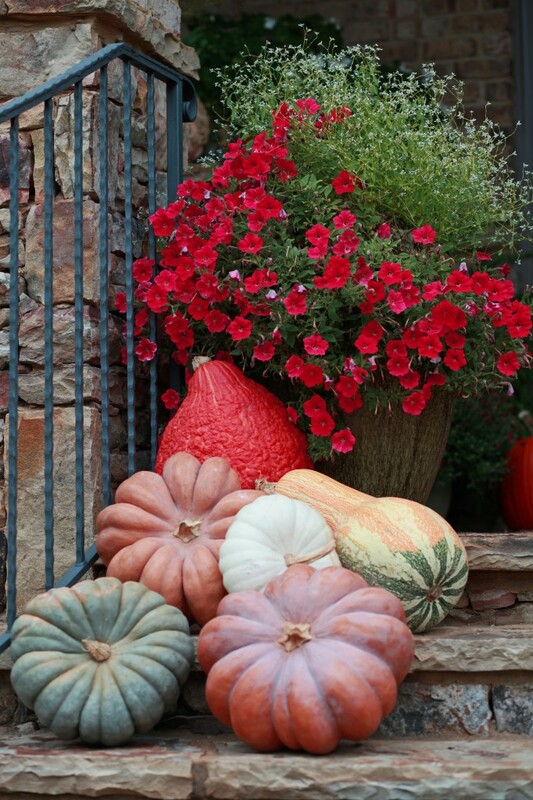 And, in the fall, she’s likely to be constructing a cascade of pumpkins on the stairs leading from her front door to her garden. 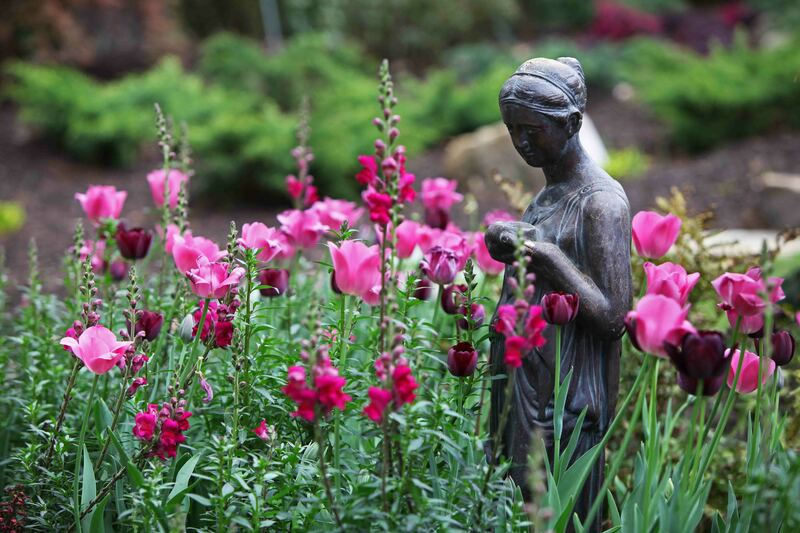 Brenda’s garden embodies all of the aspects of an artful garden. It is a delight for the senses. Her colors flow, huge white blooming Annabelle hydrangeas yield to beds of pink Angelique then mutate again to a stand of mauve tulips. Her textures weave together seamlessly—a burnished iron frog sits above delicate tendrils of a Mandevilla vine in one corner, peach-colored roses soften the blue needles of a deodar cedar in another, and, in a far recess, a stone bridge carves a path to the graceful threads of a lime-green conifer. Try as I might, my garden just never quite measures up. Thankfully, Brenda does not live too far away allowing me the opportunity from time to time to view what she has created and see where I’ve gone wrong. Note: All photos courtesy of Brenda Addington. PS. My conscience won’t let me close without saying that my garden is really our garden. My husband, one of those slightly eccentric characters that inhabit this world, is largely responsible for our garden. He is the expert who reins in my dabs on the canvas, insisting that the plants we come by are sited according to their cultural needs first—artistry be damned!